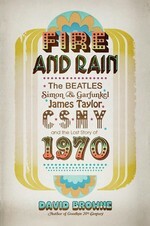 This book takes you back to 1970 and chronicles events from that year along with the story of four pivotal albums released during this period: James Taylor’s Fire and Rain, Simon & Garfunkel’s Bridge Over Troubled Water, The Beatles’ Let It Be, and CSNY’s Deja Vu. I am a fan of all four albums and the artists behind them. But I also have a personal history with the year 1970. I was thirteen at the beginning of 1970. I was at an impressionable age. My profession, avocation, and musical tastes were formed during this time period. The first big event for me that year was the Apollo XIII space flight. You can read about how that flight impacted me in the post Apollo 13 and me: How one space flight shaped my future. Next came an aircraft accident on May 2, 1970 that I didn’t even learn about until 29 years later. I would eventually go on to write about this accident in the book 35 Miles From Shore: The ditching and rescue of ALM Flight 980. And like most teenagers, the music I grew up with is the music that I still enjoy to this day. And for me that meant mellow, laid back, and acoustical. That’s not to say that I didn’t listen to my share of Led Zeppelin, Jethro Tull, Deep Purple, Black Sabbath, etc. I just gravitated to the music of Bread, Seals and Crofts, Carole King, America, and of course the artists covered in this entertaining book. The book is written in a narrative style. It’s more than just a look at the behind the scenes of the making of four great albums. It’s more of a detailed look at an entire year and the personal conflicts that surrounded each of these albums. Since I lived through this period and was intimately familiar with the songs, It was easy for me to conjure up images and sounds. I think I’ve seen James Taylor in concert more than any other person or group. I’ve also fumbled my way through some of the songs from these albums on guitar. But despite my familiarity, I learned a great deal that was new to me. Like the fact that the opening line to the Sound of Silence – Hello darkness my old friend- was a reference to the times Paul Simon used to sing and play guitar in his parent’s bathroom. There were many examples of how events in the lives of the musicians became the roots of songs, like Graham Nash’s Our House was based on his relationship with Joni Mitchell, and James Taylor’s Fire and Rain was about the death of a close friend he met while in a mental hospital. There were also plenty of examples of how the events of the time led to songs, such as Neil Young writing Ohio after learning about the shootings at Kent State. The narrative style allows the author to tell the story behind these songs as if you were sitting there watching the creative process taking place. The one thing all four albums had in common was that all four were created amongst a great deal of turmoil, whether it be James Taylor’s inner turmoil with drugs and his mental health, or the interpersonal turmoil between individuals. The one obvious thing missing from this book are the actual songs. The technology is there. I read the book on a Kindle. But just think how great it would be to click on a link and listen to the song for the nuances described in the text. Or play a video of a concert talked about in the book. After all, isn’t that the great promise of multimedia? Unfortunately, the legal obstacles involving copyright and royalties make it virtually impossible for that to ever happen. However, thanks to Youtube, many of the concerts and songs talked about in the book are just a quick Youtube search away. So let me start you on your way with a sampling from each of the four albums.